As New Yorker Susan Vitti watched the devastating attacks on the World Trade Center twin towers on September 11, she knew she had to do something, but what? She was only one person. Then inspiration struck. She contacted Entemann’s, the famous and favorite bakery of New Yorkers, and requested donations. Over the next nine months, Susan was personally responsible for the distribution of 14,000 boxes of donuts, bagels, cakes cookie and pies. 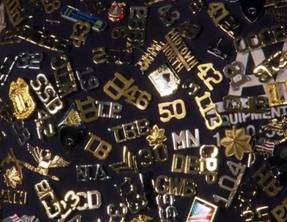 In gratitude, the fireman began pinning their “collar brass” to her clothing as a small gesture of appreciation and thanks. Susan claims watching these men work 12 hour shifts 6 days a week, month after month, was so inspiring, it gave her the motivation to become a private duty nurse. She claims today she is able to easily work 16 hour shifts when she envisions the firemen working at ground zero. Were any of us to see this remarkable collection, without knowing the story behind it, we might consider the pins an interesting curiosity. In reality, for at least one individual, they personify the hundreds of men and women she fed and supported. These tiny emblems represent long months of connection, sharing, hugs, tears, gratitude and support. I read a bit on the ranking structure to see if I could identify any of the pins. The gold oak leaves (3 o’clock, 7 o’clock) belonging to Battalion Chiefs, and the winged eagle represents a District or Platoon Chief. These are some of the highest ranks a fireman can achieve, yet all worked shoulder to shoulder with the Lieutenants, Captains and general firefighters, heroes one and all. Regardless of rank, they’re all top brass in my book, including Susan Vitti. 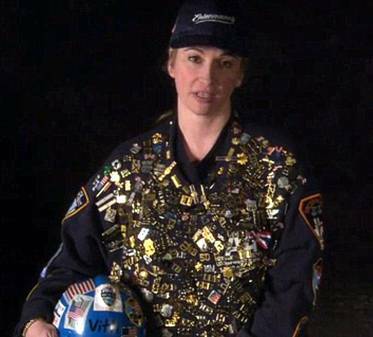 I discovered Susan’s story when I viewed the PBS Special “Objects and Memory” which aired on PBS June 3, 2014. (These photos were captured from the movie.) http://video.pbs.org/program/objects-and-memory/ The show, which also addresses the Oklahoma City bombing and the Vietnam War Memorial, examines how otherwise ordinary things assume a heightened importance to us because of their associations with significant experiences. In the film, museum curators and archivists explain this phenomenon. 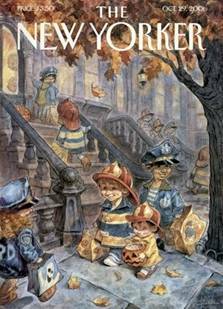 Note: On of my all-time favorite New Yorker covers appeared on October 29, 2001. I included it in an Epilogue to my blog Lady Liberty, http://handkerchiefheroes.com/lady-liberty/ and it seemed appropriate to include it here. Reading about those who contributed whatever they could to help rescue Lady Liberty rekindled images of 9/11 for me. It was a time when you could tangibly feel a city, a country, united in a common cause. Photos from that day captured images of heartache and heroism, pathos and patriotism. As powerful and evocative as those images were, for me, the picture I found particularly poignant surfaced a few weeks later. It was a simple illustration that graced the October, 29, 2001 cover of The New Yorker magazine. It depicted children immersed in the door to door ritual of trick or treating. Every child was dressed as a superhero that year – each wore the uniform of either a fireman or policeman. The image, as it turned out, was a true reflection of what Halloween looked like across our nation. How inspiring. Cartoon heroes -Batman, Superman and Spiderman, were replaced with flesh and blood heroes. Heroes whom we could touch and hug and say thank you to, but who, on some level, remained larger than life in our collective psyche. I can still see that image in my mind. It brought a bittersweet feeling of both loss, and renewal, of triumph over tragedy. This collection, and the story behind it, brought tears to my eyes. Fabulous work by many people on every side, along with glorious generosity.